Since 2014, CityScape has designed and implemented over 70 stormwater restoration projects throughout Baltimore City and the surrounding region. Completed projects include more than 25 rain gardens, 12 bioretention, 12 microbioretention, and 20 impervious removal projects. The result is a net removal of over 163,000 square feet of pavement surface and treatment of an additional of 16.5 acres of impervious drainage area. ​The Parks and People Foundation, in partnership with Baltimore City Department of Recreation and Parks, received a large grant from the National Recreation and Parks Association to overhaul and green Ambrose Kennedy Park. The 1.75 acre park, located in the highly urbanized Johnson Square neighborhood, is within walking distance of nearly 11,500 people, along major bus routes, and across the street from Johnston Elementary School. The park contains a neighborhood pool that is heavily utilized in summer months, but there was no permanent restroom facility. Additionally, the surrounding park had deteriorated to contain vast amounts of broken asphalt, damaged fencing and recreational courts, and minimal green space. CityScape was hired as the Prime Consultant and Lead Designer to improve the park. New park features include a splash pad, a boulder seat wall, a three-stall pre-fabricated restroom building, new basketball courts and fixtures, pathway and court lighting, park benches, a large bioretention area, and extensive green space with canopy trees and native plantings. Services by CityScape included site plan development, stormwater management plan, erosion and sediment control plan, landscaping design, plan review and permitting, and coordination of subconsultants for utility, structural, and geotechnical design. CityScape also provided construction oversight assistance and is developing as-built documents for the final project. ​MedStar Harbor Hospital (MHH) is one of only two waterfront hospitals in Maryland, with an extensive lawn and six parking lots directly on the Patapsco River. Any rain water or pollution flowing off the MHH property directly enters the river and subsequently the Chesapeake Bay. In their mission to improve the quality of Baltimore’s rivers, streams and harbor, Blue Water Baltimore identified MHH as a major institution where a stormwater intervention could have a significant and highly visible impact on water quality in the Patapsco and ultimately the Chesapeake Bay. With funding from the Chesapeake Bay Trust, a multi-stakeholder team of non-profit, consulting and government staff worked with MHH’s Facilities Department and Green Team to 1) improve MHH’s internal community knowledge of stormwater importance and its connection to the health of the Chesapeake Bay and human health, and 2) evaluate MHH’s current stormwater management practices and plan for improvements. CityScape Engineering is leading the engineering and permitting effort to retrofit nine new stormwater management practices on the campus, including bioretention areas, conservation landscaping, rain gardens, and a nature walk. Construction for these efforts is anticipated June 2018-Dec 2018. CityScape Engineering is currently performing stormwater retrofit and engineering design services for Blue Water Baltimore at ten sites, including eight churches and two schools, in Baltimore City and County. These projects include (1) green parking, impervious removal, and a rain garden to treat the parking lot of the Natural History Society of Maryland; (2) bioswale, tree planting, and impervious removal at St. Helena’s Community Center in Dundalk; (3) impervious removal, parking lot redesign, bioretention, and installation of parking lot tree strips at the Baltimore International Academy School; (4) impervious removal and rain garden installation at Amazing Grace Lutheran Church; (5) impervious removal and construction of a bioswale for the Prince of Peace Baptist Church; (6) impervious removal and construction of permeable pavement and bioretention at St Anthony of Padua; (7) construction of a large bioretention area for St Pius X Church; (8) construction of a series of sidewalk bioswales for St Casimir Church; (9) construction of downspout planters, permeable paver walkway, and a bioswale for Gallery Church; (9) rain garden and conservation landscaping at the Church of the Holy Covenant; and (10) bioretention, rain garden and permeable pavement installation at Govans Presbyterian Church. In September 2014, Baltimore City, the U.S. Environmental Protection Agency, and the Chesapeake Bay Trust announced the winners from its collaborative Growing Green Design Competition: Vacant Lots Transformed. CityScape worked with Civic Works and City neighborhood groups to develop construction design documents for 3 of the winning sites, including the Coldspring-Homestead-Montebello Gateway Gardens and Tha Flower Factory. ASCE-EWRI Permeable Pavement Technical Committee (Co-Chair). CityScape's staff, in cooperation with Blue Water Baltimore helped write a $600,000 National Fish and Wildlife grant, which was awarded to the team to design and construct four permeable alleyways and four bioretention bumpout facilities in the ultra-urban neighborhoods of Patterson Park and Butchers Hill in Baltimore City. The project was a landmark for the city, as it actively pursued urban retrofits to comply with its latest NPDES permit requirements. 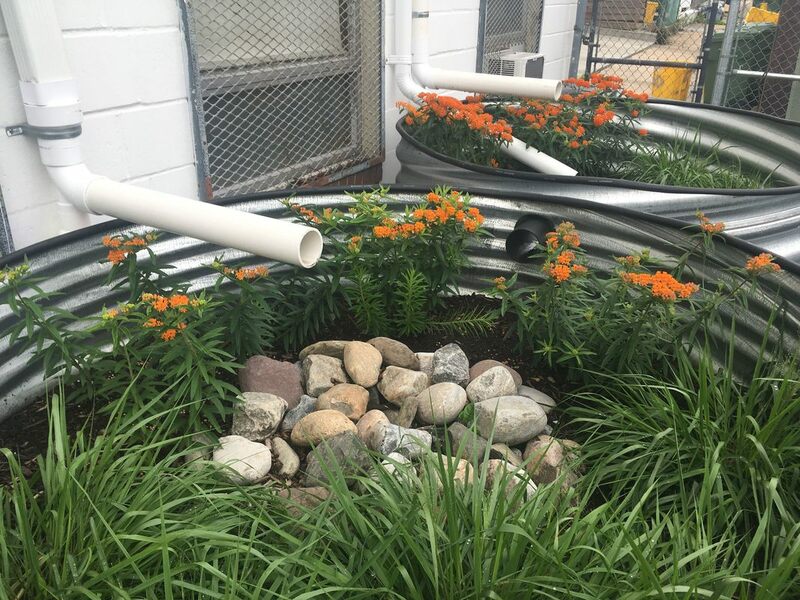 The City Department of Public Works and Department of Transportation combined to provide an additional $300,000 in matching funds toward the project, which also piloted a new and expedited permitting process for stormwater retrofits in the city to improve their implementation of such projects. Water quantity monitoring was also used to assess the effectiveness of the projects in treating impervious surfaces and to justify the treatment area for NPDES impervious treatment credit.